Reporting an Iowa Dog Bite | Hupy and Abraham, S.C.
Who Should You Call About Your Dog Bite Injury Right After It Happens? Without question, you should contact your loved ones to let them know what happened and to get the moral and practical support that you need during this time. You might also contact your employer or school if you are going to have to miss time, and you might contact an experienced dog bite lawyer to make sure that all of your rights are protected and that your potential financial recovery is not jeopardized. Iowa law requires the dog’s owner to report the bite to the local health or law enforcement official. (See Iowa Statute Chapter 351, Section 38). Additionally, physicians and veterinarians may be required to make such reports in some circumstances. And you have the right to make the report yourself. 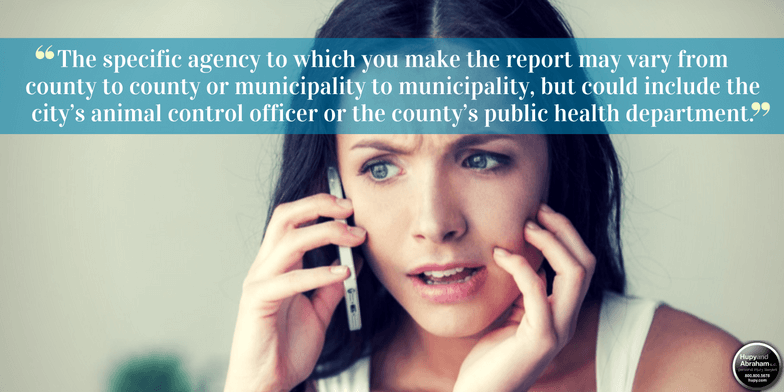 The specific agency to which you make the report may vary from county to county or municipality to municipality, but could include the city’s animal control officer or the county’s public health department. Most cities and counties have this information on their website for you. The person assigned to investigate your case may determine whether you are at risk for developing rabies and whether the dog is dangerous and other people may be at risk of getting hurt. The animal control officer or other official assigned to your case does not have the right to determine liability, nor does the official have the right to award you damages for the injuries that you have suffered. Instead, in order to make a fair legal recovery, you are going to have to negotiate a settlement with the dog owner or the dog owner’s insurer, or you are going to have to pursue a court verdict. Thus, while it is important for you to report your dog bite injury to the local government—and we encourage you to do so—it is just as important to contact an experienced dog bite lawyer for more tips about protecting your legal and financial recoveries.